The sound of the future has arrived. Again. 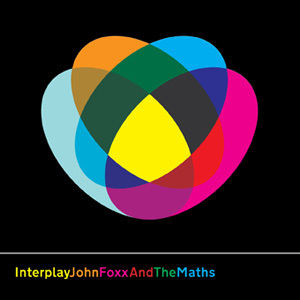 Released in March 2011 amidst an array of nothing but positive reviews, Interplay is the first album from John Foxx and The Maths – a collaborative affair with synthesiser guru, Ben Edwards (Benge). The first taste of The Maths came in the form of Destination/September Town, a digital only single in December 2009. Following this, the duo worked exclusively in Benge’s Shoreditch studio on a plethora of vintage analogue synthethisers to create what is perhaps one of the most pivotal albums in Foxx’s illustrious career. After four years of mostly instrumental and collaborative releases or compilations, Interplay sees a welcome return of John Foxx’s often overlooked talents as a vocalist and lyricist. In fact, it’s fair to say that Foxx’s vocals have rarely sounded better – rich and wonderfully emotive, even when distorted by various effects. Interplay opens with “Shatterproof”, a dark and menacing affair with fragmented vocals and brooding synth lines. Beginning with a sequence reminiscent of Kraftwerk’s “Numbers”, “Shatterproof” is like a whirlwind tour of every classic synth sound you ever loved. Things lighten up a little with “Catwalk”, which wouldn’t have sounded out of place on 2006’s From Trash. “Catwalk” boasts a typical Foxxien cinematic lyric, often referencing early track, “Young Love”. One of the many standout tracks is the upbeat “Evergreen”, which echoes early Depeche Mode in style, and provides a timely reminder of what a damn fine pop lyricist Foxx can be when he wants. “Watching a Building On Fire” features a duet with Ladytron vocalist Mira Aroya, and is followed by the album’s title track; a sombre and sparse piece featuring real bass (yes, one of those guitar things! ), and Foxx’s most moving vocal, sounding like a long lost David Bowie classic. The romantic escapeism of “Summerland” marks the mid-point of the album, and is another contender for catchiest track. However, the warm summer breeze soon blows over to make way for the gritty, throbbing electronica of “The Running Man”, which evokes a fusion of images from 1950s Americana, pulp comic action and 1970s science-fiction. “A Falling Star” is another key track and the most moving piece on the album. Beautifully nostalgic and reflective, it sits nicely alongside “Evergreen” and “Summerland”. 2009’s “Destination” has been re-worked into a darker and more sinister sounding track, and is followed by “The Good Shadow”, which closes the album. With its heavily treated vocals and haunting melody, “The Good Shadow” begins sounding uncannily like Kraftwerk’s “Franz Schubert”. The colours which adorn the Barnbrook-designed packaging all perfectly converge through the music of Interplay, and at just 42 minutes in duration, it is an ideal length to take in and play again. Analogue synths have never sounded so relevant, and this feast for the ears is testament to the longevity of these classic machines. Close followers of Foxx’s work will find many of the lyrical themes reassuringly familiar, although musically, Interplay takes things to a whole new territory. The word “analogue” may instantly bring to mind the sound of Foxx classics like Metamatic or Systems of Romance, but Interplay is no nostalgia trip, bearing little resemblance to Foxx’s previous works. Hypnotic, poetic and atmospheric from start to finish, Interplay ticks every box, not only showcasing John Foxx at his very best, but lays the foundations for what is hopefully the start of a fruitful collaboration.